Forward Email Add-on allows you forward a copy of the sent emails. You can also choose to Cc/Bcc on the emails, sent out from your WordPress site. Once you activate the license and install the add-on from the Email Log Add-on’s (WP Dashboard → Email Log → Addons) page, you can then activate the add-on from the Plugin’s (WordPress Dashboard → Plugins) page. 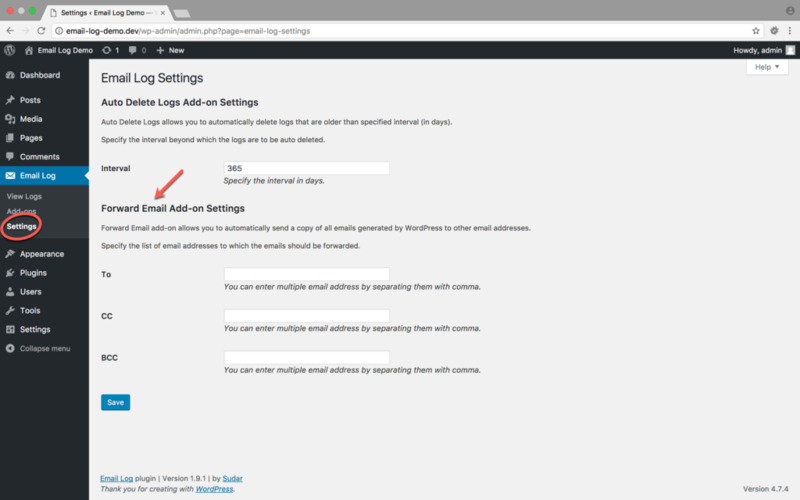 To forward a copy of the sent emails, you can configure the email addresses from the Email Log Settings (WordPress Dashboard → Email Log → Settings) page, under the Forward Email Add-on Settings section. A copy of the sent email will be forwarded to all the emails configured in this section.